Two bills allowing the state of South Dakota to prosecute pipeline demonstrators and their funders — and use money from damages to fund law enforcement and pipeline costs — were passed by the South Dakota Legislature on Thursday. The bills are now headed to Gov. Kristi Noem’s desk to sign in the coming days. Due to the bills’ emergency clauses, once signed, they will immediately become law. Introduced by South Dakota Gov. Kristi Noem, R, on Monday, the bills would protect the 1,179-mile-long Keystone XL pipeline, a planned TransCanada project that would slice through the state carrying 830,000 barrels of crude oil a day. The Great Plains Tribal Chairman’s Association has opposed the bills, representing the leaders of 16 tribes in the region, none of whom were consulted for the legislation. Conflict around the bills simmered during a joint appropriations committee meeting on March 6, centering on the undefined reach of a “riot” and what that word truly means. Under South Dakota law, a riot is a felony, with “riot” defined as three or more people executing or threatening force or violence without the authority of law. (Noem said she considered the #NoDAPL demonstrations to be riots.) The “riot-boosting” law extends the state’s authority to sue rioters and any number of their supporters, and allows it to charge anyone who “solicits or compensates any other person to commit an unlawful act or to be arrested” three times the damages sustained. It’s unclear whether “encouraging” a “riot” could cover acts like GoFundMe donations or posting bond for arrested demonstrators. Republican proponents insisted the bills were necessary to help counties and the state address fees from unlawful assembly, citing the millions North Dakota incurred in damages in the wake of the #NoDAPL demonstrations. 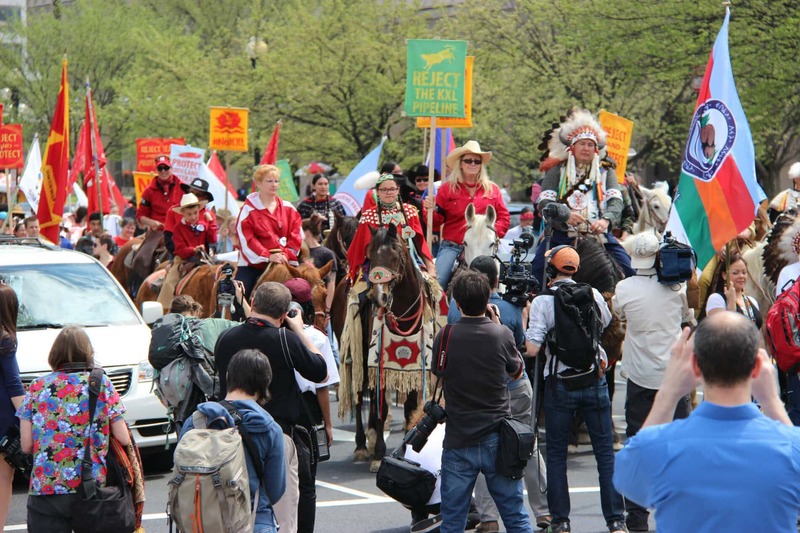 Supporters also called the legislation urgent, noting the Keystone XL could begin construction as early as summer 2019, though others noted that the pipeline’s outstanding permit requests negated that chance. Opponents insist that the laws would effectively snuff out constitutional protests such as those at Standing Rock. Thompson was the only tribal chairman who spoke at the hearing; many tribal leaders from South Dakota were in Washington, D.C., testifying about federal appropriations for the Bureau of Indian Affairs and the Indian Health Service. During a press conference, Gov. Noem said the bills were meant to target out-of-state agitators, alleging that George Soros, a philanthropist and common right-wing target, was one of them. But there is nothing stopping the laws from impacting tribal nations or citizens. Unlike the tribes, TransCanada had a seat at the table as the bills took form, Noem said. The company will also contribute to the PEACE fund. Members of the South Dakota state Legislature voted 14-4 to recommend passing the riot-boosting law and 15-3 to recommend passing the PEACE fund. Some members made last-minute attempts to amend the PEACE fund to allow tribes to submit claims for its funding, but the committee chairman, Republican Sen. John Wiik, dismissed them. Sen. Ryan Maher, R, whose district neighbors the Cheyenne River and Standing Rock reservations, also voted no. “I’m not going to support 189 today just because of how ‘riot’ can be construed,” he said. Documents obtained by the ACLU of Montana showed the federal and local law enforcement had “anti-terrorism” training sessions and “riot-control formations” in 2018 to prepare for predicted Keystone XL protests. At the Standing Rock demonstrations, extremist vocabulary came hand-in-hand with mass arrests and the use of water cannons and teargas grenades. Some journalists received riot charges at Standing Rock, which were later dropped. This article was originally published by our media partner, High County News. It has been edited for IC with permission.